I made a thread back in 2008 about it when it was announced, but I cant find it again. Oh well, here's a new thread. Hopefully this will be better than the Avengers show that used to come on in the 90s on FOX Kids. That was a failure of a show. This will air on Disney XD this fall. A bit sooner than originally expected which was 2011 summer (to go along with other MARVEL live action film releases). Here's hoping it will be good and doesn't get canceled after a season or two like all the rest of these recent MARVEL animations. 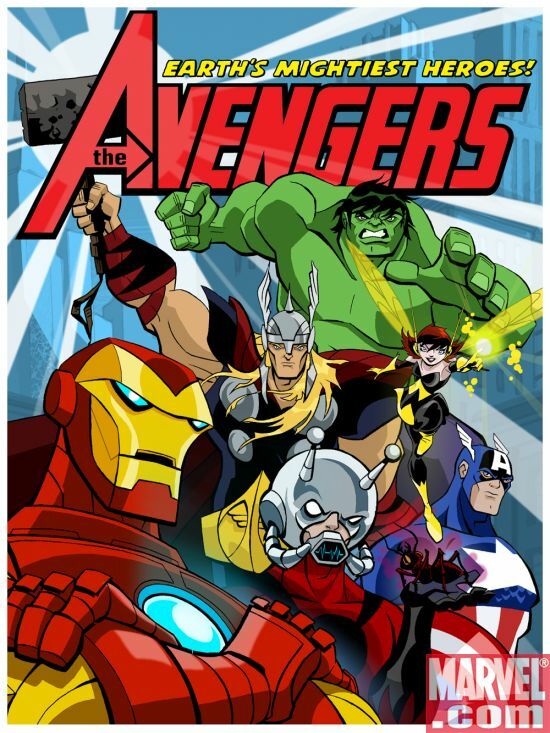 The art style of the animation is iffy to me but (through my dad) always enjoyed the Avengers story. Might be nice to see a series out of it. Iron Man as the leader? Are you kidding me? Iron Man is beast but I don't think he should be leader of the team looks like it could be good though. The animation reminds me of Teen Titans. Movie execs probably saw Iron Man as the more popular character, and therefore made him the leader. Though I have no idea why Ant Man looks completely different in the poster than how he looks in the video. What do movie execs have to do with a Marvel produced animation? Captain America is the leader of the Avengers, not Iron Man. End of story. That's like making Batman leader of the Justice League instead of Superman. Just stupid. That's because the poster has Ant-Man while the video has Giant-Man. Well to be fair, Iron Man did provide all the funding and the "hideout" for the Avengers and was a kind of leader for a period before Captain America showed up in the original cannon. Now as we all know, nothing really stays cannon as far as these various TV shows and movies come along, but bits and pieces are usually taken out to use in the new productions. If I am not mistaken though, Stark did indeed become the leader of the Avengers for quite a while (while not really starting out as the main leader). There have been many shifts of leadership in the Avengers anyway. The show officially debuts on Disney XD October 20th. However starting Monday coming up, every day they will have an "introduction" episode for each character. I will probably be at work when it all comes on. But I'll check it out when I can to see if it will be a series I will stick to or just another flop. It looks alright, I might watch it. I have a total disdain of all characters from Marvel, except for the X-Men, so idk if I will watch this. Especially since the art and animation style irritates me. It's called Executive Meddling. Wouldn't be the first time a movie/series/whatever changed because the higher-ups said so. So far out of the mini-sodes, the ones that I have seen actually, I liked the ones with Captain America and Bucky. Then there was the Hulk one and Thor. The others were kind of, meh. I suspect that a few other characters from the MARVEL universe might make some cameos in this show. Not sure though. But I have seen a few references to others, for instance in an episode with the Pyms, a man in a car is reading a news paper with the heading about a vigilante punishing people and Punisher's skull on the front page. Then there is an episode with Captain America in WW II and you get a quick shot of Wolverine and his famous "Bub". I don't know how they would tie in to the story (whatever the story will be) but I think it might be interesting depending on the characters they choose. Seeing as how the Marvel universe does cross over very frequently (Avengers itself is a big crossover) I wouldn't be surprised. At the very least if the characters themselves do not appear or are not any significant part of the story, there will be mention of them. So did anyone catch the first episodes? I was at work so I missed them. Any good or negative things to say about it? After work it aired again at 1 AM but I was going off to sleep so I only caught part of the first episode. From what I saw, it was pretty good focusing on the downfall of S.H.I.E.L.D. 's detention centers and prisons. So the season finale aired this morning. I missed a few of the earlier episodes but I caught enough. I really liked the show. To my surprise it's actually really good (though I shouldn't be surprised because Christopher Yost is the show runner). Turns out my prior grievance was a minor thing. Tony is more of an assumed leader and as the series progresses Cap becomes a de facto leader in combat. It's a nice duality as opposed to any explicit leadership. The story was also very strong. Some episodes are standalone but there is a very clear sense of an over-arching story. The next episode may be different to the last but all are very important to the ultimate progression. To me, the highlight was most definitely the Avengers/HYDRA/AIM fight in New York City. The use of the Cosmic Cube and episode's end revelation made me very excited for future seasons. The art direction is average, but not a big deal. I imagine it was a case of Marvel being cheap since at the time of production they were probably still independent. Not as good as it could be, but not bad enough to detract from the show. I hope to see it improve in future seasons. If I had any gripe about the series it would probably be the depiction of Loki. I've always known him to be a soft and sympathetic villain, which is what really makes him shine as a character, and in Avengers: EMH his voice and characterisation is a bit more harder. But then a sympathetic villain is probably not a desirable element for an intended children's cartoon. I'll certainly be buying this on Blu-Ray once the complete season is released. So, as always the U.S. lags so far behind in the broadcasting of these animated shows. Finally getting to the season finale now. It's pretty good. I will probably finish up the season online since the rest of the finale comes tomorrow and I wont be home to watch it. I finished the first season long ago and thought it was pretty good. A lot of things for season 2 were set up throughout the whole season from the very first episode. I got the Thor Blu-ray and the preview for season 2 shows a lot of new characters. Of course the Skrulls are going to play a major part in this season, Ms. Marvel is there, The Fantastic 4, Dr. Doom, The Vision, War Machine, Red Hulk, and a bunch more. Anyway, this isn't the video that is on the Blu-ray but I thought I'd post it anyway. I'm hoping the preview/trailer for season 2 will be up soon though so I can post it. These are sneak peeks for season 2 but older ones. Anybody ever watch it? I love everything about it. Can't wait for Season 2, it launches in a month. Well, that thread is admittedly pretty old and I even searched on the search bar for any clone threads, but nothing came up. Aw well, I'll just use that one.